How captivating is the cover for this book? It reminds me, just a little, of the cover for The Forest of Hands and Teeth, because of the trees and the girl in profile. Luce Price is sent to a mysterious boarding school, Sword & Cross, in Savannah, Georgia, after a freak accident causes the first boy she's kissed to burst into flame. All her life she's been haunted by terrifying, creepy shadows, which follow her everywhere. Lately, they've seemed to become more malevolent and powerful. While at the boarding school, she is immediately taken with two young men there. Daniel Grigori is gorgeous but quite distant. Cam is certainly friendlier, but almost too pushy, unlike standoffish Daniel. I found it hard to suspend my disbelief at times. Why does the school require its juvenile delinquent students to dress only in black? Wouldn't that make them harder to see if any of them try to make a break for it? So, what is Daniel exactly? I was thinking vampire, or some kind of supernatural creature, maybe an angel? Luce has been getting reincarnated every 17 years, Daniel instantly falls in love with her, and then she dies. This cycle has been repeating for centuries. This cycle turns out to be different. It's different because Luce has never been baptized, which means her soul won't neccesarily come back if she doesn't make it this cycle. This seemed like a huge plot hole to me. Why not run out and get a quickie baptism, the moment she discovers this critical weakness? 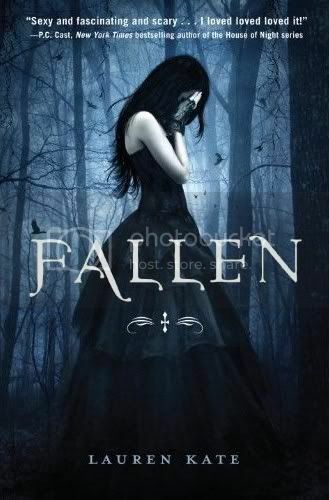 Despite having some compelling plot points, a young person whose paranormal powers are starting to waken, a gothic boarding school setting, and a terrific surprise ending with an unexpected villain, Fallen just wasn't everything I was hoping it would be. The writing was leaden and I struggled to finish this book. In a field crowded with teen paranormal romances, this book simply failed to stand out.